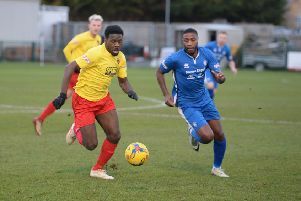 Former Dunstable Town defender Peter Kioso has been snapped up by National League side Hartlepool United. The 18-year-old, who came through the ranks at MK Dons and spent last term with the Blues, attended pre-season training after being recommended to Pools boss Matthew Bates. He did enough to impress the hierarchy at Victoria Park and earn a contract, going on to make his debut in the 1-1 friendly at Billingham Town on Saturday. Boss Bates told the club’s official website: “We’ve had Peter in since Monday after he was put to me by someone I trust in the game and I’ve been impressed. “Ideally, I wanted to see him in the game on Saturday but we played an 11 v 11 in training on Thursday and I just saw how good a player he was. “He’s the right type, he can play anywhere across the back, brings balance and he’s a good age. “He’s got a lot of improvement in him if he gets his head down. Meanwhile, Dunstable have confirmed that a number of last season’s squad will be returning to Creasey Park for the new campaign. Captain John Sonuga has agreed to sign, along with goalkeepers Will Hunt and Nathan Harness. Boss Tony McCool will also be working with Charlie Black, Ben Collins, Daniel Triff and Kieran Ogden once more after they all committed themselves for the coming season. The Blues started their pre-season campaign last night whey they entertained Arlesey Town at Creasey Park.